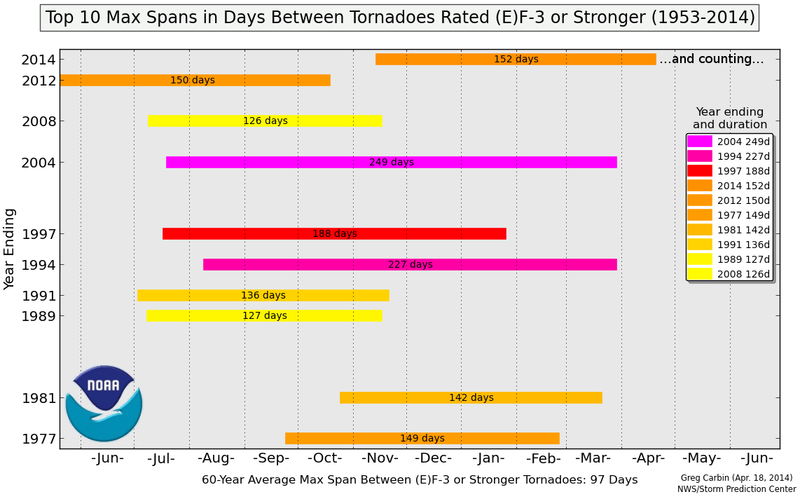 Tornado season so far may be the slowest in a century | Watts Up With That? 2014, with the zero to twenty bin on the far left, can’t really go any lower. April 21, 2014 in extreme weather, tornadoes, Weather. Yep. However, let the warmists get one EF-3 this spring that blows away someone’s chicken coop, and the MSM will play it up like the San Francisco Earthquake of 1906. You’ll be hearing about how it was caused by global warming for the next week. Can we now expect AGW True Believers to begin hyping the EXTREME LACK of weather………….. No? Our entire winter and spring have been WAY off so far. January was unbelievably cold, February wasn’t great, and March started off with one of the worst and heaviest ice storms we have had in decades. In fact, to everyone it has seemed that in March, we had our typical February weather, and there was no quick warm up – April so far has felt like our typical March weather, we still had a couple nights in the low 30’s last week. Now, 21 days into the month, it finally feels like spring, but it is about a full month late. 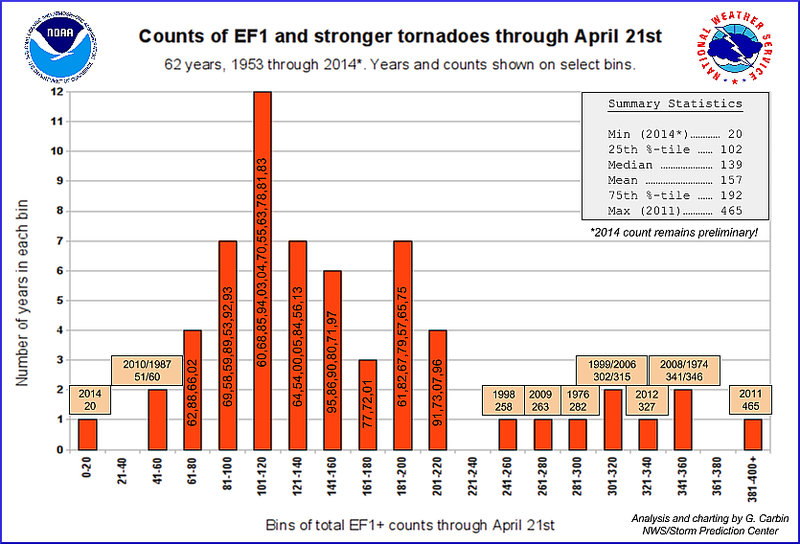 How that relates, I think – the months of April and May are typically our heaviest tornado season, as the warm air from the gulf clashes with the cold air from the north over the plains. (November, give or take a couple weeks, is the next worst) But if our weather cycle is off (delayed) by almost an entire month this year (which is sure what it feels like) that may mean that our tornado season this year is going to happen in May and June. This would explain why nothing much has happened so far. It doesn’t matter if there are no tornadoes because they are becoming more frequent and stronger. If you get record snow it didn’t happen. If it doesn’t rain for 2 days its the worst drought ever. If it rains for 5 minutes its a flood. The hurricanes that aren’t occuring are the worst ever. If its colder its because its hot. Take another hit off the crack pipe and all is well. The histogram chart is useful in that it covers a wide time range (68 years) but apparently a narrow class of tornados. 2008 is listed as 341, but on the spaghetti chart.it is over 600, along with 2011. It’s worse than we thought __________________________ … just fill in the blank. …and with all the cold fronts too! Yes, but the heat and tornadoes are in the pipeline. The tornadoes are hiding at the bottom of the ocean. It’s the only rational explanation. It is the cold before the warm. 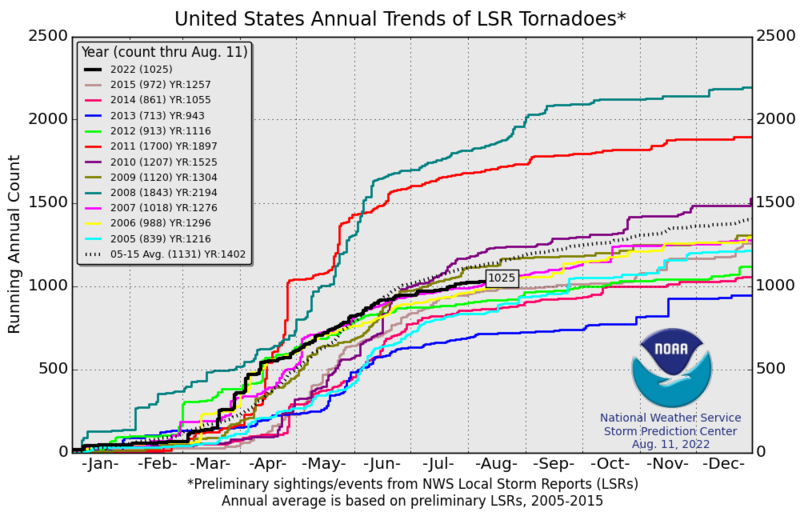 Last year was the lowest number of tornados on record. And this year is starting out far lower than that even. 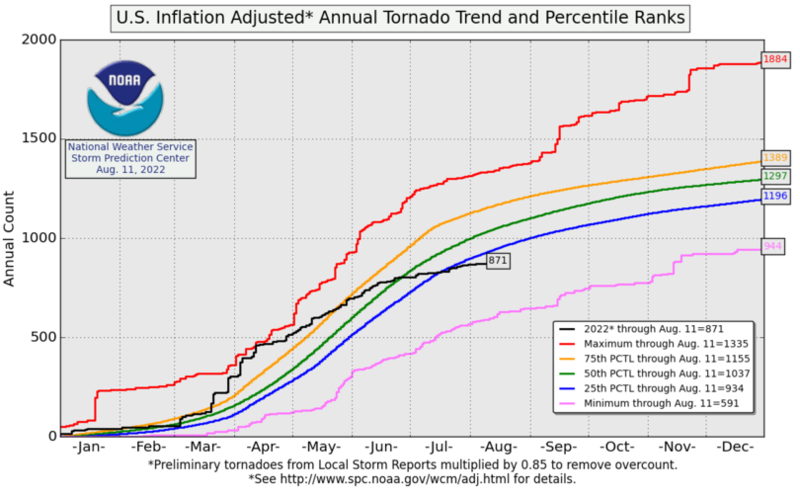 This “inflation/undercount-adjusted” chart of tornado counts (going back to 1954) is a better one to use since it accounts for tornados which would have been missed in the earlier periods. 2014 is the lowest on record to date … 2013 was the lowest on record by the end of the year but was not the lowest at this time of year. Well, since weather and climate prediction have such high suction quotients, you could actually have negative tornadoes. Am I right in thinking that global warming would lead to FEWER weather extremes due to the reduced temperature difference between the poles and the equator? I have heard Warmists talk about increased energy in the system but the weather is being well behaved though. When will it start behaving badly? The Great storms of the Little Ice Age. Al Gore complained. I wonder why? It’s good to see he read about record keeping and maybe observations. Why is it that Al Gore insists on the consensus and tells us to listen to the science, but then complains when they veto his claims as a credentialed theologian? That is one scenario. Another possibility may be that, with a reduced zonal flow, more Arctic air will be allowed to flow further south. This could actually increase the temperature contrast in southern areas of the U.S. and lead to more storms there. As is often the case in meteorology, there is more than one plausible outcome. Anyone who states they know the definitive answer is either lyng or hasn’t been in this weather game very long. Yes, think of the days with “Polar Vortex” and Gulf Coast air masses colliding this year. The temperature gradients across the Mississippi Valley were high. Did anyone predict low tornado activity under those conditions? And if so, what was the justification? The “return of the Polar Vortex” was a “Good Thing” in that it is better to snow some more than rain and melt the thick snowpack and create floods. NOAA March 20 flood predictions, mostly low. Our children won’t know what tornadoes look like. Awwwwww. While one cannot make light of tornadoes, because a big one will come, and it mainly matters where it hits, but this is actually quite astonishing. Growing up in southeast Kansas, near Joplin, Missouri, and living in Oklahoma, near Moore, this is very personal for me, and it is simply a blessing that there have been nearly no tornadoes so far this year. Still, prepare. Also, pray for rain. I modelled the tornadoes for the last 30 years and I can’t get the number of days without an F3 unless I include the effect of AG CO2. The tornadoes are there but 70% of them are undetectable because they are Dark Tornadoes. The Australian cyclone season as it comes to an end has been such a non event that our BOM is claiming everthing near and far and I mean far as an Australian cyclone. They are constantly “cooking the books” with zero official scrutiny. The keep telling us cyclones are increasing. When your claiming them as “ours” 2500 klm’s of shore, I can see why. They say that the latest named “Jack”is number 10 for the season. But what the BOM fails to mention nearly all of them have been nothing more than large rain depressions. Quite common during the monsoonal season but their claiming them as cyclones and nobody and I mean nobody is questioning. Here’s a little from the link refering to “Jack”. “The system is currently located 2500 klm’s from the western most part of the continent”. “Jack is not likely to impact western Australia, how ever as it dissipates into a deep low pressure trough some rain may be carried over southern parts of WA towards the end of the week”. An Australian cyclone 2500 kilometers of shore (in another country)which may or may not give us a bit of rain. An inconvenient truth for John Holdren. The Obama WH is well accustomed to the political need to distort the truth for public consumption, usually by telling a half truth, that leaves a false impression on the naive. Question is: How will the WH direct NOAA to fudge-up some bogus distorted message on severe storms for the media to release? Maybe like Trenberth, they are collectively holding their breath and hoping that an incipient strong El Nino will temporarily save their dying AGW cause? EF1 counts are notoriously unreliable that far back and this graph is likely to be spurious. I would suggest digging out the same thing but looking at EF2+ and EF3+ . These do give fairly consistent results since they are a less dependant on detection rates like smaller storms are. Forecast shows that the U.S. will now dominate the circulation of the western and cool air. Thanks for that. Since we can’t look into the future I tend to look at the past. Below is the Medieval Warm Period and the Little Ice Age. 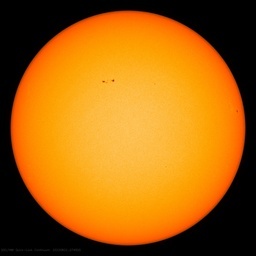 A hypothesis is presented that a change in climate after 1250 AD from a period of optimal climate for long-distance voyaging (the Little Climatic Optimum, 750–1250 AD) to a period of less favourable and finally inhospitable climate for long-distance voyaging (the Little Ice Age, 1400–1850 AD) influenced the Polynesian migrations (300–1400 AD). The Little Climatic Optimum, with its persistent trade winds, clear skies, limited storminess, and consistent Walker Circulation may have been an ideal setting for migration. The Little Ice Age with its increased variability in trade winds, erratic Walker Circulation, increased storminess, and increased dust from volcanism may have helped [prevent migration. Such changes in climate would influence the migration pattern through physical perception and decision making by the Polynesians, rather than having a direct impact. Speaking of NOAA; Does anyone know why they haven’t yet published the Global Analysis for March? So this is the result of “Carbin” pollution? (Sorry, but I had to.) I have noticed that a lot of storm chasers have resorted to posting their ‘Best of’ photographs from years past, as this season has been a bust so far. Technically, this is extreme weather too. So if the Global Warming advocates are positive that climate change will create more tornadoes, does this not show that their entire premise of global warming is wrong? 2010 actually seems to have started slower than 2014, but quickly jumped up to the middle range. So we’ll see. Yes, and when they finally come out of hiding they will be ten times worse because then they will be Sharknados! Well, the explanation is super obvious, and I can’t believe none of you are able to see the truth. You’re all forgetting that Former President Bush controls the weather. Remember when he recruited that hurricane because he hates black people (Kanye’s words, not mine)? Now, Bush is too busy with his painting to bother with creating natural disasters. Thus, less tornadoes. Thanks, Bush! Crap. The Global Warming Fraudsters are wrong again. Maybe Obama Lies are contagious and all Liberals must lie due to their DNA. No, no, no, you’ve got it all wrong. A decrease in tornadoes is exactly what we expected to see and it’s the new norm. Not a biggie. IPCC can correct this by inverting the y-axis in their graphs. The University of East Angles released a study today that indicates due to a miscalculation of historical tornado strength and frequency, and all historical records have been adjusted to more closely reflect reality. In so doing the University has announced that the last two years are now ranked among the worst years for tornadoes on record – tying for first and second place respectively. NBC has already attributed the lack of tornadoes to the “Polar Vortex”. Since there have been several past years when similar jet stream patterns were observed with correspondingly cold winters, have the years following them also had a dearth of tornadoes? The Polar Vortex is responsible for the extreme change in tornado numbers, and the Antarctic Ice Cap is melting so fast it’s causing the Ocean to freeze at unprecedented low latitudes. Climate Science is a forgiving science. I for one would say good, the US is finally doing its part. I mean, we only have 4.4% of the worlds population yet typically account for 75% of the world’s tornados. We needed to cut back on them so it’s good to see we are doing our part. Oh, noes! “A severe tornado drought”! Crank up those windmill motors. We gotta close the tornado gap!